Dress up your kids with this skeleton style jumpsuit to leave him or her an unforgettable memory at Halloween! 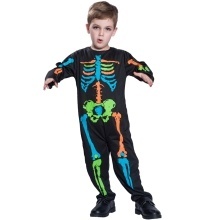 Colorful skeleton style jumpsuit, excellent role-play costume for little girls and boys. Perfect for Halloween, Cosplay, themed party and more. 3 sizes optional for girls aged 3 to 10. 2. Hand wash cold separately. Do not bleach. Line dry. Cool iron if needed. Do not dry clean.